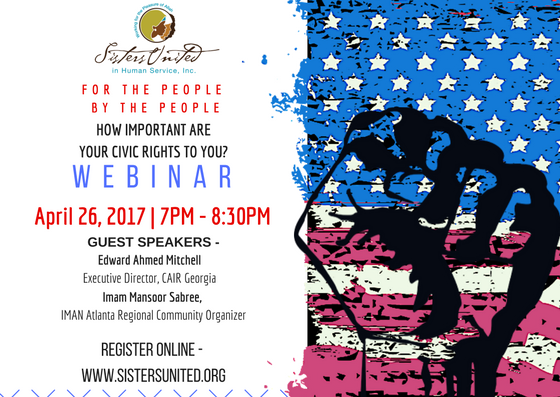 2017 EDUCATIONAL WEBINAR - Sisters United in Human Service, Inc.
​FOR THE PEOPLE, BY THE PEOPLE – HOW IMPORTANT ARE YOUR CIVIC RIGHTS TO YOU? Sisters United in Human Service, Inc. invites you join us for an informative presentation focused on responsible civic engagement and the fundamental rights of each citizen. “O you who believe! Stand out firmly for justice as witnesses to Allah, even if it is against yourselves, your parents and close relatives …” (al-Nisa’, 4:135).